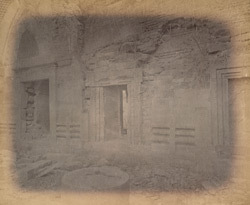 Photograph of the Adina Mosque in Pandua in the Malda district of Bengal, taken by Joseph David Beglar in the 1870s, from the Archaeological Survey of India Collections. The Adina Mosque in Pandua, near the ruined city of Gaur, was built in c.1375 by Sikandar Shah I (r.1358–90). It is one of the largest mosques in India and although largely in ruins, it is one of the best surviving examples of early Indo-Islamic architecture. The vast barrel vaulted central transept was unique in India at this time. The interior is 500 ft (152.4 m) long from north to south and 300 ft (91.4 m) wide from east to west. It is built of stone up to the imposts of the arches with the upper part of the building composed of brick. This method of construction would became widespread in Bengal. The basalt stone used was taken from earlier Hindu and Buddhist structures. The courtyard is enclosed by cloisters on four sides, each divided by a series of bays. On the western side is the prayer chamber, or liwan, which consists of five bays, whereas the other sides are three bays deep. This view shows the entrance to the Ladies' Chamber from the Ladies Gallery.